We work with a large number of young people to provide interactive and engaging experiences to ignite and support their interest in folk arts. From grassroots folk dance workshops in schools to professional development for aspiring musicians we offer something for all ages and have access to many experienced and committed artists and tutors. The Young Halsway programme is for young people to explore folk arts, experiment, find their own sound and fuse different genres of music and dance including rock, hip hop and contemporary. Having run for the last ten years it is extremely successful and has helped launch the professional career of a number of artists as well as inspiring many more to experiment under the guidance of industry professionals. For ages 8-12. Everyone welcome, join us for fun with folk. This is a great introduction to playing and learning about folk music working with supportive and experienced artists. An introduction to folk for young people aged 13-18. Prior experience – as either a singer or musician – is essential, but it’s ok if you’re new to folk. For ages 13 – 18. You’ll have been on a course with us before or have some previous knowledge of folk. You will work with a team of exciting professional folk musicians and work towards a performance at Sidmouth Folk Week to a 2000 strong audience. For ages 16 – 25. You’ll be a competent musician or singer, keen to work at a higher level. You will have access to industry professionals, advice and skills development opportunity. This is the course to do if you have aspirations of being a professional musician or educator. 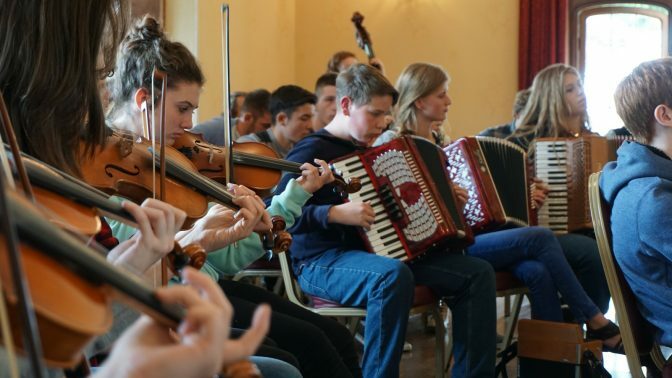 Young Folk participants operate as a company: taking warm ups together, developing technique in various disciplines, learning repertoire and creating contemporary interpretations of traditional material. They live, work and play together, with opportunities for informal jams and social gatherings to enrich their understanding of the folk arts. Our Young Halsway Courses are led by young folk professionals, under the experienced leadership of Will Lang (Intro, Intermediate, Advanced) and Claire Bailey (Junior). Each course includes a dedicated Pastoral Lead – usually Claire Bailey – to ensure all participants are well supported whilst away from home. Will Lang is a modern British Folk musician, composer and producer, who is a core tutor on Newcastle University’s Folk and Traditional Music degree. One of the most versatile musicians on the British Folk scene today over the last few years, Will has not stopped. Will is well known for his collaborations, bringing a folk influence to many prolific performers including Mercury Music Award-winning Nitin Sawhney, The National Youth Choir of Great Britain, Tabla player Aref Durvesh and Northern Spirit Singers in the BBCs Choir of the year. Will has recorded studio albums in Australia and Ireland and three British prisons. Along with his choral works Will has gained mainstream BBC Radio 3, Radio 6Music and Radio 2 airplay with his album track ‘Moving on Song’ featuring HMP the Verne Chorus for the album PBS6. In 2012 Will was made a musical associate of the National Youth Choir of Great Britain and commissioned to write a series of folk inspired choral pieces to be performed in the four corners of the country from 2012-2015 starting at The Sage Gateshead ’12 and Rochester Cathedral, ’13. Most recently, Will’s choral and orchestral work ‘Canny at Neet, Bonny at Morn’, focusing on North East life was premiered in Durham Cathedral, alongside Will Todd’s Gala and Gloria, with great reviews. It is his work in Folk and wider-reaching genres that enables Will to inspire musicians to discover Folk music and encourage them to explore the roots of their traditional music.